The Plymouth Table features a beautiful distressed finish for a unique time-worn, old-American look. The distressed black finish on the table contrasted with the classic wood stained table top creates a wonderfully rustic appeal! This American-made dining room table comes standard with a 1" thick table top and a height of 30". 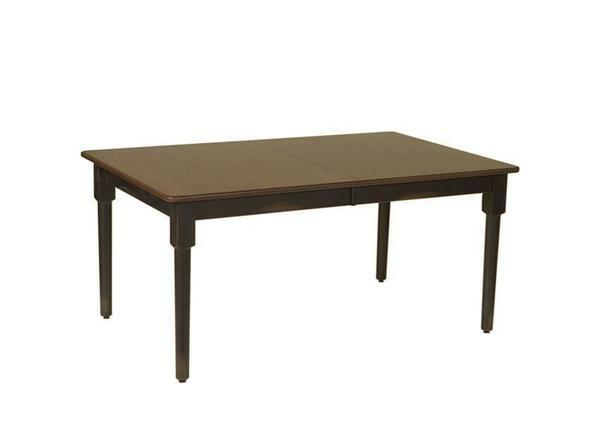 However, the Plymouth Dining Table is built to order and thus nearly every design element is open to customization. Note: Tables 54" long and shorter are designed for no more than 2 extensions. I just wanted to follow up on our order. It arrived last Saturday morning and is in great shape and gorgeous. I've attached a picture. Thank for your help coordinating the delivery.